Steam drifts up and away from the mug of tea or hot chocolate in your hands as you sit around the fire, watching the camp cooks lay out breakfast. 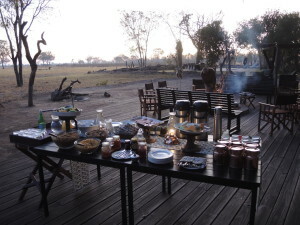 Deft hands moving plates and stirring porridge, making toast on the coals or offering tea and coffee with big smiles! Normally, we are woken very early, around 5am in summer, or 5.30am in winter and given 30 minutes to rise, rinse the face, get clothes on and grab day pack with camera, spare batteries and cards, binoculars, sunglasses, cream, lip balm, scarf or buff which might be ‘on’ already, and head out the door. ( With all this stuff, it is easier and smarter to prepare all of this the night before)…ditto your clothes. To breakfast. If it is still dark, the guides will come and collect you, as you are NOT ALLOWED to walk alone in the dark…lest you disturb an elephant or some other ‘Big & Hairy’ on or near the pathway. Breakfast is enjoyed, and then you head off with your trusty (State qualified) guide to the open 4WD game viewer, and climb up into the back. 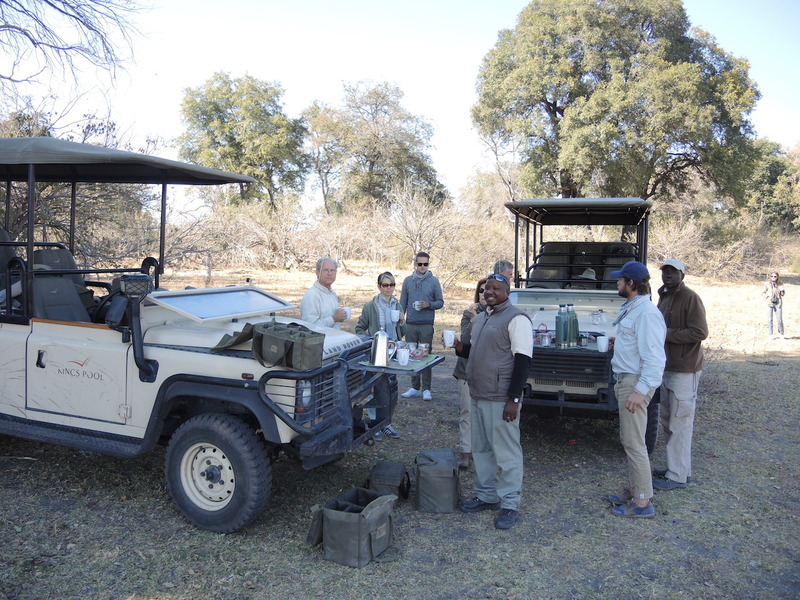 Two or three rows of bucket seats may accommodate only six of you, each with a clear ‘window’ view.The guide may then brief everybody on the protocols of game viewing from a vehicle…..for your safety, and the wildlife too, and then settle down to business. His business is finding spoor…foot prints..which may indicate a predator of interest to track, or some animals that again may reveal action or a chase sometime in the night, and of course just search the bush for any wildlife or birds as he is driving along. All of it is of interest to him, and he tries to make it interesting to you too. You see the bush through his eyes. Wildlife in most areas you visit has achieved some degree of trust in the vehicle and so will frequently stop and stare intently at you all in the vehicle. This allows you, the visitor to take some great photographs! Elephant, buffalo, giraffe, lion and other predators are able to be photographed safely and observed quietly from the comfort of the safari vehicle. A huge advantage for most visitors who come to Africa to see wildlife. In some areas the game will maintain a greater distance between itself and the vehicle, and this in time changes as the game becomes habituated. 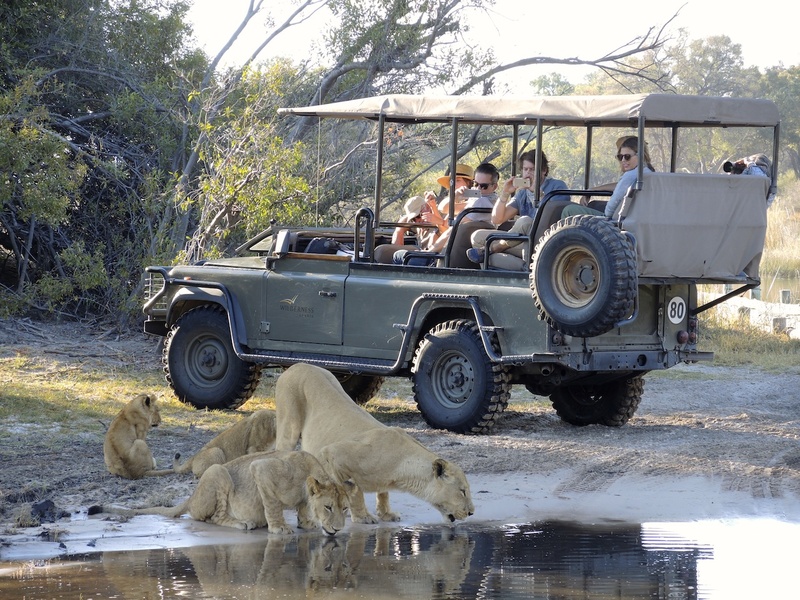 One of the protocols of the game drive is that one remains seated at all times, talk quietly, and avoid sudden movements in the vehicle when in close proximity of a large or dangerous animal. Lions and leopard will readily walk past a vehicle full of humans with ‘large’ eyes…..within a few feet in fact, and be completely relaxed about this. Bird calls become real to you as the guide identifies the bird to you, and possibly even why it’s calling. Bird calls often reveal predators concealed in the bush. So do monkeys and baboons. Both of these are eaten by leopard particularly, and their sharp eyes can spot a ‘spot’ literally many hundreds of yards away if the cat is in the open grasslands! Amazing. Animal behaviours are suddenly understood by you as you witness their daily lives, either just interacting or displaying courtship activities. Different habitats become important, and their reasons for existing too. After a while, it should become clearer that animals ALL live separate lives, in neighbourhoods like human suburbs, with the killers and the innocent like human society too. Out here, the killers are at least honest! 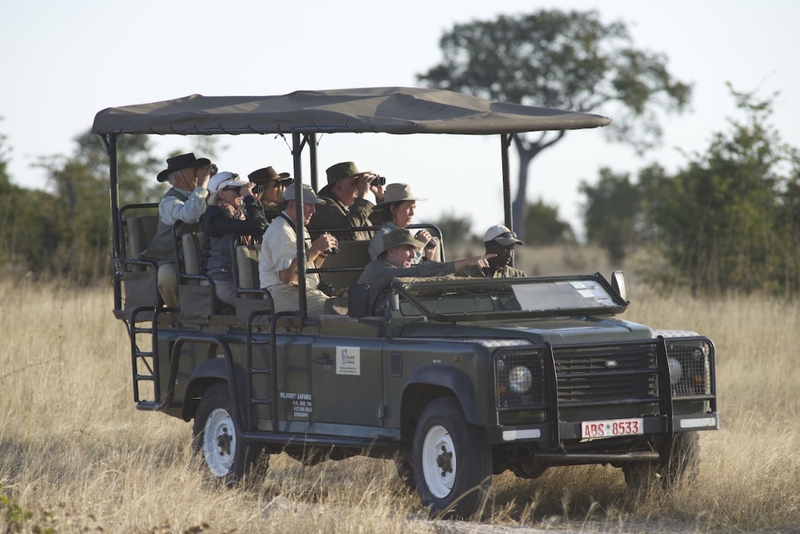 The vehicle cruises along with everyone in the back searching the bush or staring ahead lost in thought, ready at a moment to look at something the guide may have seen. Tea is taken sometime midmorning in a suitable shady spot, before wending slowly back to camp for a brunch. 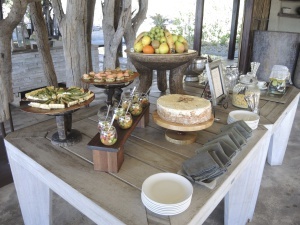 Brunch is normally a sumptuous affair with a breakfast menu and a lunch (hot or cold) menu being available. Sometimes it’s a complete surprise in the bush, under a shady tree somewhere. Tables may be joined and communal or separated according to guests wishes. After brunch at midday, it is ‘free’ time. Time to exercise, swim, read, write cards and journals or sleep! Most people sleep, despite their best intentions. Afternoon Tea is served at about 3 or 4pm, and then game drive process is repeated, but normally in a different direction unless there are lions on a kill, or a leopard in a tree with a kill hanging over a branch. 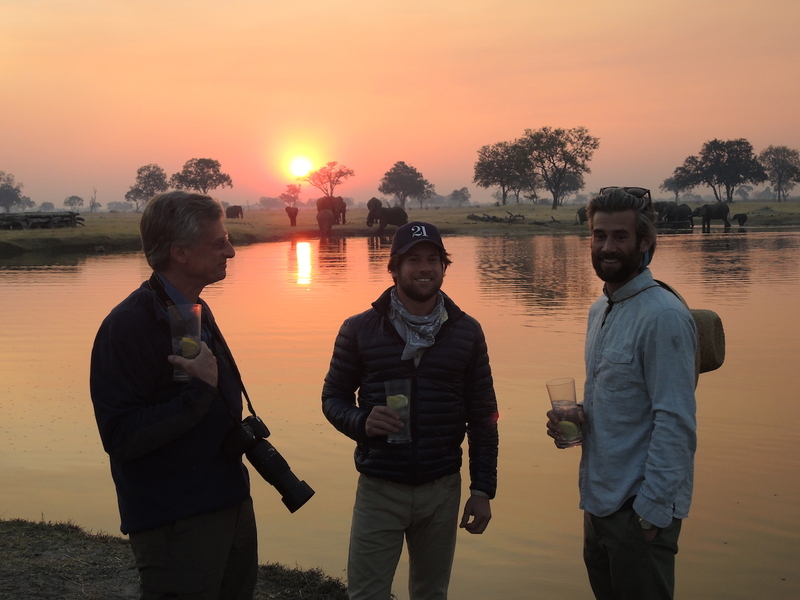 The afternoon drive culminates with sundowners….a popular tradition that involves stopping at a suitably scenic spot in the bush for cocktails. 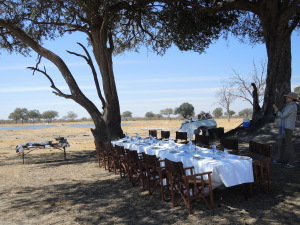 The guide will commonly pull up the built-in table on the front of the vehicle, spread a small table-cloth and place bottles of various spirits, ice and lemon slices…on view. Snacks of various tastes from biltong to nuts, canapés to chicken satays and similar are arrayed for your enjoyment….dear, oh dear. After sunset and much fun, we wind our way back to camp, sometimes by the light of a spotlight searching for early nocturnal wildlife like porcupines, hyenas or even white tailed mongoose and bushbabies!